Seton's Girls just missed VISAA State Championship Runner-up by only 2 Points! Congratulations to the new Girls VISAA Division II Champion from our DAC Conference, Trinity Christian School! Coach Koehr's Blog is Now Posted. Read about Mairead Geiran's four (4) swims in the Finals and the great performances from all of our Relays! Here and here are links to some professional pix from the meet. Next Practice: Tuesday, November 5th, 2019 at 6:04 a.m. at the Freedom Center. Did you know that Franciscan University now has a swim team? Click here to read a letter from Mrs. Carroll to the VISAA concerning their divisive decision to prohibit VISAA Swimming from using Liberty University because of their Biblical views on morality. Disappointingly, the VISAA tabled the issue until January to develop "general guidelines" on venue rentals for States. No final resolution has yet been announced. Want to watch most of Seton's all-time greatest swims? Check out the Seton Swimming YouTube Channel by clicking here. "Who has it better than us? Nobody!" We focus on better. Good takes care of itself. We offer it up. We love our teammates. 750 Swimmers from 52 Teams, music blasting, kids singing and dancing, costumes in a parade, hugs and tears from Seniors swimming for the last time, Seton families gathering between sessions at our rented river house for Pasta and Chinese noodle feasts, and even our own swim team St. Valentine’s Day Dance. Most importantly, we saw loads of huge PR times from our Swimmers and a Girls third place finish in Division II. These were just a few of the highlights from the 2019 VISAA State Swim and Dive Championship at the beautiful new Jeff Rouse Swim and Sport Center in Stafford, VA.
Last weekend (Feb 14-16, 2019), we took 19 swimmers and a like number of parents into this incredibly fast meet - and the swimming I saw from our team was beyond my expectations. Our kids always seem to excel on the big stage every year at States, but even I was amazed by the results. We had huge drops from a number of swimmers, including a Boy’s relay that dropped 12 seconds and several swimmers that had multi-second drops in their individual events and relay splits. It was the last meet for senior Mary Heim, and even I found it a bit emotional. Mary has been such a great part of our team, and she has been a great leader also. I’ll always remember my last year with Mary in the pool. I’ll also always remember the Heim family on deck with Seton Swimming. Mary is Hank and Laura’s baby, so this is their last year too. The Heim Family has been a part of Seton Swimming since the mid-2000s. We’ll miss you Heim’s! Seton wasn’t officially a co-host for the meet, but I was so proud to watch Bill Dealey and Jim Griffin working with Ginger Schmidt of Trinity Christian School to manage all the timing and scoring systems, Charles Seltman who served as one of the Starters and Deck Referees, and Therese Griffin who served as a Stroke and Turn Judge. The meet required about 125 volunteers, and little Seton was able to fill many of the key roles. Seton definitely shined last weekend, both in and out of the water. It was an incredibly fun trip for our team. For the fifth time, we tried renting a house off of AirBnB so that we had a place to gather between sessions for comradery and team meals. This time, we had a wonderfully spacious house right on the Potomac River – just beautiful! The relatively warm February day on Friday allowed us all to enjoy each other’s company down by the river for a wonderful afternoon of team togetherness after the first day’s Prelims. Thanks to the leadership of Mrs. Luevano, with a team of fellow Moms including Mrs. Geiran, Mrs. Heim, Mrs. Griffin and Coach Dalrymple, we had wonderful team meals that didn’t require long waits for restaurants to serve drinks and take orders. I’m quite sure no other team was eating like we were at States this year! One of the highlights of meet for me was our Thursday night dinner at the Team House. The Captains had put together gift bags for each swimmer and Shane Koehr had brought his ever-present guitar amp and microphone. What started as a presentation of gift bags turned into a wonderful event that we are going to have to every year. After the gift bags, Shane had “The Cone” – a traffic cone from the Seton parking lot that ended up at the State meet a few years ago. Since then, “The Cone” has been signed by every State swimmer. The Captains had a ceremony where all of the new State swimmers were honored with a chance to sign “The Cone”. Even Coach Mulhern got to sign. The signing of The Cone was followed by impromptu speeches from each Captain that were amazingly inspiring. I was so proud of our team that night, let me tell you. The whole event was conceived and led by our Captains, and it was a beautiful way for everyone to be reminded of the larger lessons of Seton Swimming. I always say that, “Swimming ain’t about swimming.” Thursday night was a great demonstration of that. To bookend that great opening event, the Captains held their own St. Valentine’s Day Dance for the team at the House on Saturday night since all of the swimmers missed the Dance at Seton earlier that same night. It was so much fun watching even the shyest swimmers jump in with gusto. I also enjoyed watching Mrs. Luevano, Mrs. Griffin, Mrs. Heim and Coaches Mulhern, Santschi and Dalrymple get into the act! Thank you, Captains, for your great leadership this weekend and this entire season! I was also fortunate enough to be voted by the other coaches as the VISAA Women’s Team Coach of the Year for the 2nd time. My wife always tells me that I get more from coaching swimming than I give. This weekend was just another example. This meet was unbelievably fast. Imagine a Boys 200 Free Relay where the slow guy went 21.35! Of the 24 total events, there were ten (10) new Meet Records. With only the top 16 finishers getting points, it is very hard to score at all in a meet like this. The result is a premium on the fastest swimmers, particularly in the Division II. Another aspect of the Meet that was a lot of fun to watch was the Girl’s competition for the Division II title. I came to the meet with the idea that we could have a great experience and swim well, but it never occurred to me that we might become competitive for the Championship. 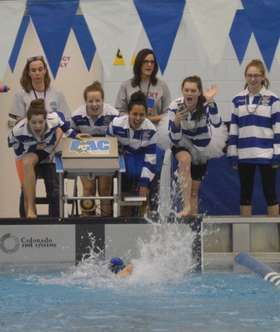 In the end, my prediction that Trinity Christian School was going to take the Girl’s Division title proved to be correct, but after the way we swam on first day, we all started to see the possibility, however small, of taking the title ourselves. In the end, our girls lost the Division II Runner-up by only 2 points to Williamsburg Christian. This was the first time after seven (7) years where Hampton Roads Academy did not win the Girls Division II State Championship. On the Boys side, we were able to score points for the first time in several years with a 16th place finish in the 400 Free Relay – so that, in itself, felt like a huge victory. And unlike the girls, Hampton Roads Academy was able to seal the deal for a nearly unbelievable 8th straight year. Recall that our State Championship is scored like one big championship meet. The team with the highest point total is declared the “Overall” State Champion, and the Division II team with the most points is declared the “Division II” State Champion. Let me take you though a bit of the roller coaster I lived as our girl’s seemingly non-stop rain of PRs put the heat on Trinity Christian and Williamsburg Christian, only to have their girls respond in kind. A look at our detailed results showed that, of the 28 flat start or relay swims for which we had accurate times, 19 of them were lifetime bests – 68%! Any one who knows me knows that I’m really no fan of losing, but when I know we did all we could do, then I can live with it quite happily. Trinity Christian and Williamsburg Christian did all they could do too, and in the end, it was just too much for us. The first event on Friday for Prelims was the Girls 200 Medley Relay. We were seeded 8th and needed to qualify for Finals in that position also. One important aspect of the way that Preliminaries work is that the eight (8) fastest finishers advance to the Championship Final (usually called the “A” Final) and then the next eight (8) fastest finishers advance to the Consolation Final (usually called the “B” Final). If you are in the “B” Final, you cannot score ahead of anyone in the “A” Final, even if you swim faster than them that evening. So qualifying in 8th is the perfect place to be because you can only get better – you are guaranteed at least 8th. After Prelims for the 200 Medley Relay, we were in the perfect spot! Our Girls 200 Medley Relay of Caroline Griffin, Mary Heim, Mairead Geiran and Mary Pennefather came in with a seed time of 1:56.09 from National Catholics, and they went 1:55.10! That beat 9th place by .05 seconds, and it also beat Trinity Christian, who qualified in 10th place, by only .24 seconds. Williamsburg Christian qualified in 13th. Now it would be impossible for TCS and WCS to beat us in this event because the best they could do was 9th and the worst we could do was 8th – and remember that relays score double points. Our splits in Prelims were tremendous. Caroline was right on her PR backstroke lead-off with a 29.29 followed by Mary Heim who swam a lifetime best 33.28 (PR split 33.82), Mairead Geiran who split 27.29 (PR split 27.55) and Mary Pennefather who split 25.24, right on her PR split. Next up for the Friday Preliminaries for Seton was Mairead Geiran’s 200 Free. Mairead came into the meet seeded 6th, and she knew she had to qualify at least in the top 8 – which she did. After cutting .92 seconds from her PR, she went 1:59.63 and held on to 6th. The Williamsburg Christian girl qualified outside the top 8, so we were sitting pretty for Finals once again. The rest of Prelims broke out with Trinity Christian putting Annalise Cornett in the “A” Final in 200 IM and Brooke Williams in the “B” Final from a blazing fast 100 Fly field. Williamsburg Christian also put one girl in an individual “A” Final and another in an individual “B” Final. The Finals on Friday night ended much like the Prelims with our Medley Relay staying at 8th and Mairead holding 6th with another .20 second drop to 1:59.43. That’s fast! By the end of Friday night, our 22 points in the Medley Relay and Mairead’s 13 points individually had Seton leading TCS and WCS 35-32-29, respectively. I genuinely was not expecting to be at this point, so I was quite pleased by these developments. Interestingly, The Steward School was actually in the lead for Division II, but they were doing it with two very strong girls (and no relays) who had 3 of their 4 total swims on Friday. With only one chance to score on Saturday, I knew that lead would disappear on Saturday night. We had a few other great swims during Prelims on Friday morning. Our Girls “B” 200 Medley Relay of Gemma Flook, Anne Konstanty, Emily Flynn, and Isabelle Luevano swam 5.53 seconds faster than their seed on the strength of tremendous splits from Anne Konstanty’s 35.55 Breaststroke and Emily Flynn’s 28.19 Fly. One thing I loved even more about Emily’s swim was how her Fly split was only about a second slower than Mairead’s. That means that next year, after Mary graduates, we can move Mairead to Breaststroke knowing that Emily can carry the load in Butterfly. In Friday’s 50 Free, Mary Pennefather swam a .67 second PR 26.21 to finish 30th. In the Bonus 50 Free, Isabelle Luevano swam a .15 second PR and Anne Konstanty swam a .21 second PR. We came back a little tired and uptight on Saturday morning, which I think was my fault. In the excitement of discovering that we actually had a chance to bring home a State Championship or State Runner-up, I think I inadvertently made too much of a big deal about it. One of our team values is Meekness which certainly encompasses control over one’s emotions. It was a valuable lesson for me in the future – boys love battle, but you gotta just stay cool with girls. The first event was the Girls 100 Free where Mairead Geiran entered as the 8th seed at 55.15. In a smoking fast Prelim, 8th turned out to require a 54.17, so even though Mairead swam well, she got bumped down to the “B” Final. As expected, the 3rd seed Brooke Williams from TCS qualified for the “A” Final and the 14th seed from WCS joined Mairead as a qualifier in the “B” Final. None of us had scorers in the 500 Free, so next up was the all-important Girls 200 Free Relay. Both TCS and Seton loaded our relays with our four (4) fastest swimmers and used seed times that were based on actual times swum during the season versus times that we thought they would actually do. To get a better idea of where we stood, I redid both seed times and came up with something very interesting. The sum of each swimmers’ best splits for the season resulted in a time of 1:44.09 for TCS and 1:44.11 for Seton. Comparing those times to the Psych Sheet showed that our seeds should have been 8th and 9th. Even more incredible was our lane assignments. We were right next to each other, with the winner potentially making it into the “A” Final and the loser being bumped to the “B” Final. It seemed like a plot twist that you might find in some novel. Williamsburg Christian was seeded 10th. Event 17, Heat 5, Lanes 2 and 3. Trinity Christian and Seton faced off. Our Girls “A” 200 Free Relay of Mairead Geiran, Mary Heim, Caroline Griffin, and Mary Pennefather exceeded expectations with some fabulous swimming. Mairead led-off with a .22 second PR 25.75. The timing system missed the exchange between Mary and Caroline so all I know is that their average split was 26.57. Given that their PR splits were 26.85 and 26.67, one or both of them must have done something very special. When Mary P. brought it home in 25.18, they had swum a relay PR 1:43.91! Unfortunately, Bishop O’Connell took 8th in a blazing 1:42.95. Even more unfortunate, for Seton anyway, was that Trinity Christian had an amazing swim, going 1:42.55 and qualifying in 6th. While Trinity was going on to the “A” Final with a floor of 8th place, Seton and Williamsburg Christian were entering the “B’ Final with a ceiling of 9th. We were seeded 9th and 10th, respectively. We were done with our realistic chances to qualify for Finals until the Girls 400 Free Relay, but Trinity Christian and Williamsburg Christian were not. Trinity put Annalise Cornett into the “A” Final for 100 Backstroke. Williamsburg Christian put a girl in the “B” Final for 100 Back and the “A” Final for 100 Breaststroke. That would potentially be an insurmountable number of points, but if we were to have a chance, we’d have to do it with our 400 Free Relay. Our Girls “A” 400 Free Relay of Caroline Griffin, Isabelle Luevano, Mary Pennefather and Mary Heim had their work cut out for them. They were seeded 19th with the best 400 Free Relay time Seton had done this season, but using the sum of their PR splits, I projected they would actually have been seeded 13th. Using the sum of Trinity Christian’s PR splits, I projected that it would be very difficult for them to Final at all, and Williamsburg Christian didn’t even have an entry. Our girls once again swam amazingly well. The sum of their PR splits was 4:01.21, but they managed to qualify in 13th place with a 3:58.81. Isabelle Luevano and Mary Pennefather were particularly amazing. Isabelle split a 59.00 on a previous PR split of 1:00.43 and Mary P. split 58.27 on a previous PR split of 1:01.09! Before the race, Coach Mulhern told me that he told Mary P. that she should be able to go 58.3. Not bad coach. Our Girls “B” 200 Free Relay of Emily Flynn, Gemma Flook, Katharine Rowzie and Isabelle Luevano swam a strong 1:52.22. Like last week, Emily Flynn was just amazing, splitting leading off in 27.62, 1.42 seconds better than her lifetime PR and 2.68 seconds faster than her best flat start 50 this season. Gemma also had a lifetime best relay split of 27.45 on a PR split of 28.61. Nice work Emily and Gemma! Caroline Griffin entered the Prelims of 100 Backstroke outside of the top 16 so we knew it would be difficult to get in. She had a great swim, cutting .82 seconds from her PR, but unfortunately, that landed her in 17th. You can’t ask any more than a big PR like that Caroline! Anne Konstanty faced off against Caroline Sykes from Trinity Christian for the 3rd week in a row. Anne won the rubber match finishing 45th while Caroline took 47th. After Saturday Prelims, which went until nearly 1:00 p.m., we retired to the Team House for naps. But before I could think about sleeping, I had some scoring to project. As I suspected after the 200 Free Relay, Trinity Christian was uncatchable. With a relay and two individual qualifiers in an “A” Final, Trinity was guaranteed at least 8th place points three times. Our case was the opposite. We had two relays and one individual qualifier all in “B” Finals, the highest we could score was 9th place. That made it mathematically impossible, short of a DQ, to catch TCS. As I worked through the math though, another surprise became evident. With one girl in an individual “A” Final, a relay in a “B” Final, and two other scoring girls in “B” Finals, Williamsburg Christian was going to score more points that night than us. The Psych Sheet for the Saturday evening Finals had us tied for the State Runner-up, at 66 points each! On Saturday evening, our Girls did everything I could have asked, and then some. The night of swimming started with the 100 Free. Mairead had a tremendous swim in the “B” Final, cutting .78 seconds from her morning swim to go a blazing 54.73! That moved her up from 12th to 11th. Unfortunately, the girl from Williamsburg Christian also swam well and moved up from 13th to 12th – so the net score didn’t change – we both gained one (1) extra point. On to the relay. The hand of poet was at work once again, because in the Consolation Finals of the Girls 200 Free Relay, we were once again in the lane right next to the team we had to beat, this time Williamsburg Christian. Williamsburg Christian is a school with only 29 girls in grades 9 through 12. Three of them are the very talented USA swimmers who had qualified for Finals a combined total of six (6) times, but that left them with only 26 other girls from which to find a 4th relay swimmer. Their coach had decided to line up their relay with the three very fast girls first and their high school-only swimmer as the anchor. Her split in Prelims was 29.72, which good for her but not normally what you see at States. Before the race, I told our girls not to panic if we were way behind before Mary Pennefather entered the water for the anchor leg, because we WERE going to be way behind. It was going to be up to Mary P. to catch up. Even though we rocked the first three legs – Mairead Geiran led off with a 25.87 on a 25.97 flat start PR, Mary Heim split 26.55 on a PR split of 26.85 and Caroline Griffin split 26.60 on a PR split of 26.67 – we were still a seemingly insurmountable 4.35 seconds behind at the 150. I told the girls not to panic, but I was not taking my own advice – until I saw Mary Pennefather’s amazing relay start. Mary ran down the blocks and with her great leaping ability, I think she hit the water under the flags. It took an absolutely incredible 24.97 split, but Mary pulled ahead inside the final flags and out-touched the poor WCS girl by .37 seconds to preserve 9th place. That was the first time Mary P., only an 8th grader, has ever broken :25. WCS held their 10th place seed, so in spite of that amazing swim, the projected ending score remained tied. At this point, things got out of our control since we didn’t have another chance to score until the last event, the 400 Free Relay. It was in 100 Back, that a Williamsburg Christian swimmer named Delaney Gibbons had the swim of her life so far. Delaney entered the meet seeded at a 1:01.01. Her 1:00.70 in Prelims qualified her 11th in the “B” Final, and he 59.16 in the “B” Final jumped her up to 9th. So instead of scoring 6 points, Delaney scored 9. It was a great swim just when her school needed it most. In 100 Breaststroke, WCA’s best swimmer dropped from the 6th seed to 7th in spite of a PR 1:07.27 so we got one point back – but we were still projected to finish 2 points behind if we didn’t improve on our 13th place seed in the Girls 400 Free Relay. With one event to go, the poet’s hand wrote yet another verse. 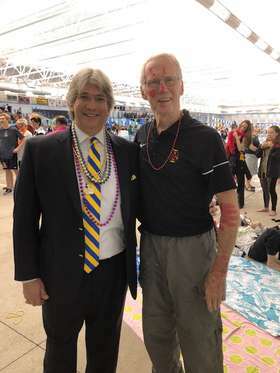 In 1977-78, I was a freshman at Bishop Ireton High School, and even though I was only there for one year, I swam for a coach I will never forget – Harry Sober. Coach Sober started practice at 6:59 a.m. and had us do sets like 10 50s on 180 (go again when your pulse gets down to 180). Sound familiar to anyone? Because I have such fond memories of my time at Ireton, I always go over to their team area and say hello. On Friday, I walked over and saw an unfamiliar face with the Ireton Cardinal logo on it. “It’s great to be a Cardinal!”, as Ireton alumni say to each other. “I am Harry Sober”, he replied. I couldn’t believe it. After more than 40 years, I was once again on a pool deck with the swimming coach who has had so much influence on what I do with all of you. Fast forward to 9:00 p.m. on Saturday night. Our Girls 400 Free Relay is seeded 13th (5th in “B” Final), and we have to get at least 12th to tie Williamsburg Christian for the State Runner-up. “Who do we have to beat?” I quickly wanted to know. I looked at my Meet Program and started counting through the seeds in alternating lanes. As I looked over the top of the paper and saw Coach Sober standing near the blocks, I realized that Relay we had to beat was from … Bishop Ireton. Three out of four of our girls swam PR splits to go 3:58.81 in the Prelims and Ireton was seeded three (3) seconds ahead of us at 3:55.76. Fortunately, our girls didn’t know it was nearly impossible because they sure didn’t swim like it. Caroline Griffin led off in what Coach Mulhern and I thought was going to be a slow time watching her swim - but we were SOOO wrong. Neither of us could believe it when we saw the scoreboard flash 59.22, 1.38 seconds faster than she’s ever gone from a flat start. Then Isabelle Luevano split 58.88! We were still behind Ireton. Mary Pennefather gained ground with her lifetime best split 58.27, but the Ireton lead was just too great for Mary Heim to make up. Our girls had dropped 2.20 seconds from Prelims with three huge PR swims, but Coach Sober’s girls dropped again as well. It was done. We fell 2 points short in a valiant effort. It is easy to focus on the accomplishments of our Girls, but we have quietly developed quite a strong Boys team – and they are all coming back! Looking through the results, I saw an amazing tally of Personal Records flat start swims and relay splits. Of 22 total swims by our boys this weekend, 19 of them were lifetime bests – that’s 86%! We are unique among the teams that go to States in that we don’t have any boys at all who are also USA swimmers (i.e. the swimming equivalent of travel soccer). The VISAA State Championship has gotten so fast that it has become very hard for a high-school only swimmer to break into the Top 16 to score any points at all. In fact, the 2 points that we scored this year were a big accomplishment for our current team – the last time our Boys scored at States was 2013. This weekend’s two points came from the improbable 16th place finish by our Boys 400 Free Relay of Jerry Dalrymple, Jacob Alsup, Shane Koehr, and Jack Santschi. Our Relay entered the meet seeded 29th with our best time for the season of 3:48.64. We’ve never run the relay with this combination of swimmers, so I knew we would go faster, but I never imagined the 12.16 second drop that I saw in Prelims! Jerry Dalrymple led off with a huge 1.92 second PR 53.87. Not only was the first time he ever broke :54 from a flat start, it was the first time he ever broke :55! Then Jacob Alsup split 54.78 on a PR split of 57.20, Shane Koehr split 55.30 on a PR split of 55.61 and Jack Santschi anchored with a 52.53 on a PR split of 52.87. Those drops allowed us to charge into the “B” Final as the 16th seed – just .47 seconds ahead of Trinity Christian School’s boys. That night, in the Finals, our Boys dropped another .78 seconds on the strength two more PR splits: Shane Koehr’s 54.56 and Jack Santschi’s amazing 51.92. Our Boys 200 Medley Relay of Shane Koehr, Jacob Alsup, Jerry Dalrymple and Jack Santschi cut 1.10 seconds from their season best to jump up to 23rd place overall on a 28th place seed coming into the meet.. Shane had a lifetime best lead-off backstroke split of 27.56 (by .89 seconds), Jerry split a lifetime best 25.60 (by .80 seconds) and Jack split a lifetime best 23.45 (by .11 seconds). Our Boys 200 Free Relay of Shane Koehr, Jacob Alsup, Jerry Dalrymple and Jack Santschi cut a huge 3.01 seconds from their season best on the strength of PR splits from all four swimmers. Shane led-off 24.87 (PR by .93), Jacob split 24.68 (cut .29), Jerry split 24.21 (cut .22) and Jack anchored in 23.46 (cut .10). Seeded 30th coming into the meet, they finished in 22nd place. Our Boys 400 Free “B” Relay of Justin Fioramonti, Evan Wilson, Cormac Clune and Christian Ceol cut 2.02 seconds from their seed time on the strength of Justin’s 1:00.18 lead-off, Evan’s leg of 1:00.19, Cormac’s leg of 58.69 and Christian’s anchor of 58.37. Justin’s time was a .31 second PR, Evan’s split beat his previous best by .39 seconds, and Cormac crushed his previous best split by 1.44 seconds. Jack Santschi (SO) cut another .28 seconds to go 23.89 and finish 42nd in 50 Free. Jack was the only member of our team to break :24 in 50 Free this year. Shane Koehr (JR) was our only other individual qualifier, in 100 Backstroke, and he ended up in 37th place. I’ve had a pretty good run in VISAA Swimming. Back in 2005, I was first elected to the VISAA Swimming Executive Committee as Secretary, and I’ve served as well as I could over the past 14 years. That term of service came to an end this past weekend when I handed the reigns over to some new blood. One of the reasons I felt that it was time for me to step down was the VISAA Executive Board’s divisive decision to ban our Committee for hosting future State Championships at Liberty University. Most of the reasons originally given were red herrings for the real reason: Liberty espouses a biblical view of human sexuality and its role in the family. Given that a significant portion of the VISAA membership is made up of Catholic and Christian schools, I just could not accept that the Executive Board would issue such a blatantly anti-Christian policy. The VISAA has a clear mission and standing as a divisive and exclusionary moral arbiter is not part of it. It should be the position of the VISAA Executive Board to not take positions on the contentious social issues of the day. Here’s a letter that Mrs. Carroll submitted last August to the VISAA Executive Chairman, Dr. Burkett of Banner Christian School, who surprisingly is a graduate of Liberty University himself. I’m grateful that several other Christian schools also submitted letters, including the Directors of our toughest competition from this year’s State Championship, Trinity Christian School and Williamsburg Christian School. I will not disappear completely from VISAA Swimming, of course. I love this sport and all that it can teach high school aged kids about how to live a life in concert with our Catholic faith. There is still good to be done. What is your favorite memory of this season? Watching our very excited girls win their 25th straight Conference Championship. What is the best piece of advice you give to your swimmers? The things that bring us the greatest joy are the things for which we have worked the hardest. Which of the four pillars of the Swim Committee's mission (good sportsmanship, team character, positive spirit, and quality athleticism) do you think is most important and why? One thing that we learn about happiness as we get older is that the things that bring us the greatest joy are the things for which we have worked the hardest. The kind of joy I’m talking about will never be achieved by sleeping-in, watching a movie, hanging out with friends, an expensive bottle of Bordeaux or even a Viking River Cruise. It’s the kind of joy we all felt last night at the Fitch WARF in Warrenton. When our alarms were going off all season in the dark and cold of early winter mornings, it was hard for us to imagine that any joy was possible from swimming at Seton at all. I’ll admit to occasionally feeling that myself, but as I’ve learned in my life so many times, subjecting yourself to suffering, in this case the suffering of early mornings and hard workouts, can lead to great joy. It continues to amaze me that I continue to be amazed by that, but in my weakness, I’m once again reminded that it is Truth: the entire basis of our faith is that suffering can lead to eternal joy. Next Season, Conference Champions again? We are only graduating two (2) seniors, both girls, and we currently have 46 swimmers who are 9th grade and below. It is hard to imagine that we won’t be stronger next season than we have been this season. Based on our performance at the Conference and State Championships this year, I am clearly excited about our chances to repeat as both the Boys and Girls Conference Champions again next year. We also need to have another great recruiting year inside the school. There are plenty of strong swimmers that have either never been on the team or would be great to have back on the team. Seton Swimming is a great community within Seton School. Let’s use the off-season to expand that community for next year. Mrs. Dalrymple is coordinating our Awards for Sunday, March 3rd at Seton School starting at 1:30 p.m. I’m traveling a lot this week and next so I’m not exactly sure what is planned beyond that, but I think it may involves delicious treats. I’ll put out more details as plans develop. It certainly has been another great season for Seton, and I’m quite encouraged by our future here. I’ve written in past blogs of the great joy that comes from achieving things that you never thought possible by working hard, believing in yourself and taking a risk. I saw countless examples of that this season, and I’ll tell you true – you swimmers are not the only one who get great joy out of it. At the end of recent seasons, I also spent a lot of time writing about our GEMS: Gratitude, Excellence, Meekness and Sacrifice. Those are the values that have powered our team toward a commonality of purpose and a mutual support for one another to do always do our best with the gifts that God has provided. I feel particularly good about the fact that we were able to tap into that power this year – and the results speak for themselves. So even though the season it over, we are still a team. I look forward to seeing you all support each other for the rest of the year outside the water the way our State Team supported each other this past weekend in the water.